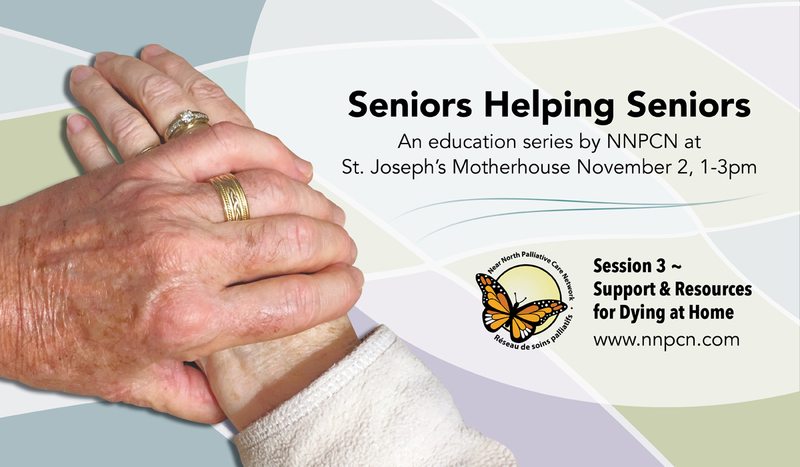 “SENIORS HELPING SENIORS” – EMPOWERING THE COMMUNITY THROUGH FREE EDUCATION AND TRAINING. ATTENTION, LIMITED NUMBER OF SEATS: RESERVE YOURS NOW! ATTENTION, LIMITED NUMBER OF SEATS: RESERVE YOURS NOW FOR APRIL! There are only 50 seats available each session. First come first served! ATTENTION, LIMITED NUMBER OF SEATS. FIRST COME FIRST SERVED. RESERVE YOURS NOW! 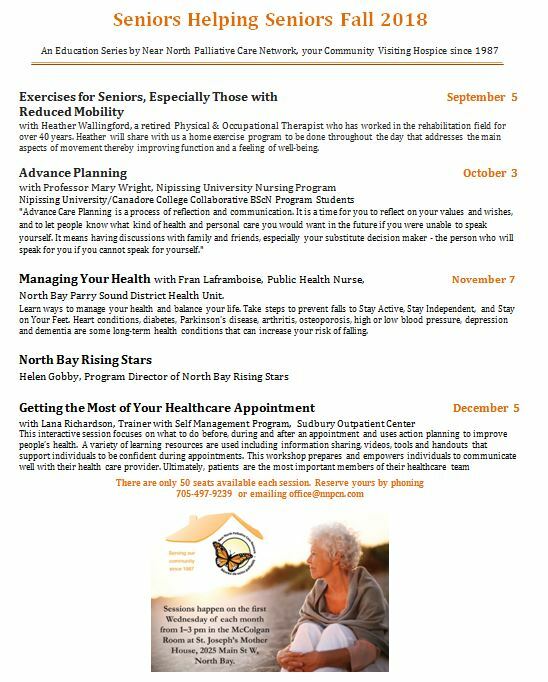 Near North Palliative Care Network, YOUR LOCAL VISITING HOSPICE SINCE 1987, launched their new Public Services Project “SENIORS HELPING SENIORS” in 2016. The idea behind the project “SENIORS HELPING SENIORS” is to empower the community with free education and training about End of Life. 75% of our Seniors choose to age and die at home. This means that we need a massive percentage of our population trained to give care to their loved ones at home while keeping a high quality of life as caregivers, and giving high-quality end-of-life to their loved ones. 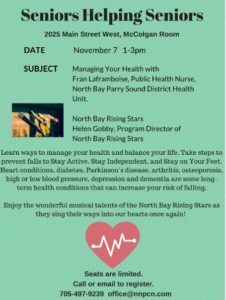 All Seniors, Caregivers, Volunteers and Health Professionals of our community are invited to participate. There is no charge. Refreshments and snacks are served. This series was initiated with a Government of Canada New Horizons grant. It was also made possible with an RTO-ERO grant, and it is now self-sustainable, thanks to your donations! 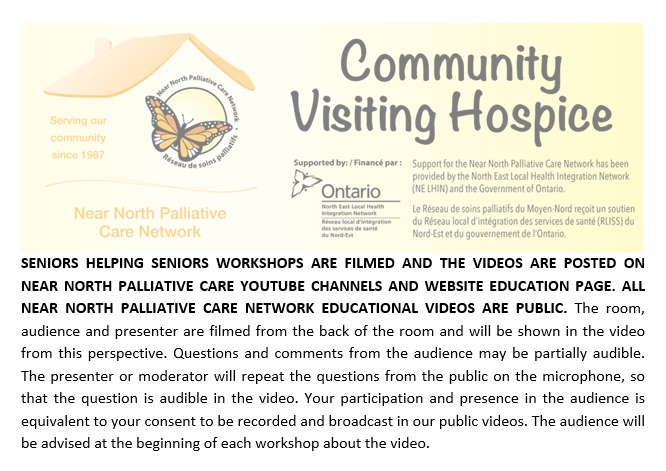 Brought to you by Near North Palliative Care Network, YOUR LOCAL VISITING HOSPICE. ATTENTION, LIMITED NUMBER OF SEATS! First come, first served. Contact us to reserve your seats! 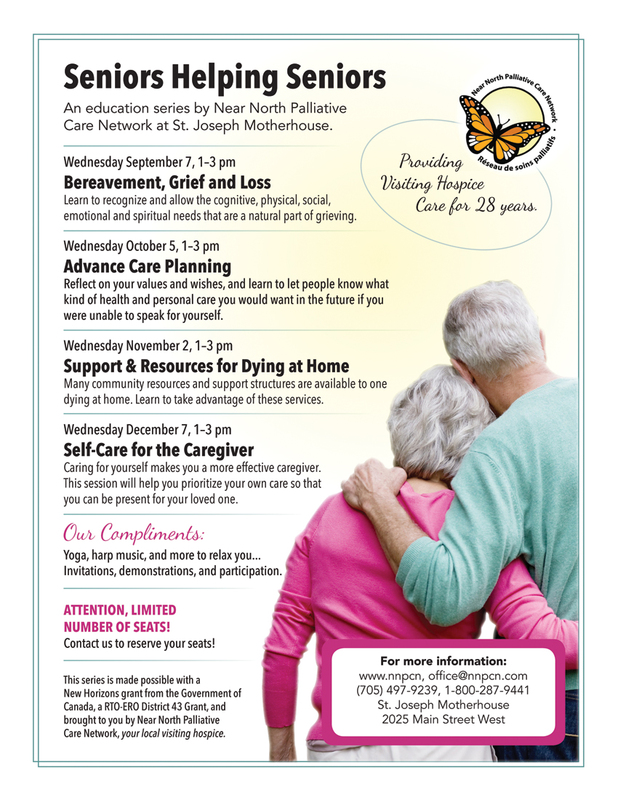 NEAR NORTH PALLIATIVE CARE NETWORK: YOUR LOCAL VISITING HOSPICE SINCE 1987. You can continue to support NNPCN, YOUR LOCAL VISITING HOSPICE! At the website Canada Helps, there is an option to become our monthly donor. Please remember NNPCN between your Hydro and telephone bills, and SUPPORT YOUR LOCAL VISITING HOSPICE all year through! Near North Palliative Care Network, your local Visiting Hospice since 1987! The support our volunteers provide to our clients and their families is an essential part of their journey, as they deal with terminal illness and end-of-life challenges. ATTENTION: maximum 50 seats each session. Reserve yours now! Holistic Health and Wellness – A path to strength, health and vitality. DESCRIPTOR: My journey as a practitioner began some 18 years ago when I began to study eastern healing methods, and the science of Kinesiology. This led me to refine my study of the body and understand how it relates to the world around us. Through this study I discovered the relationship between the eastern meridians and Myofascial planes or connections in the body thanks to Tom Myers and his Anatomy Trains. The relationship of fascia, and its function in the body, and the ways it connects the body became my focus. The interrelationship between fascia, and kinesiology connected me with one of the world’s experts in Myofascial Release, Walt Fritz. Through Walt I have developed a unique skill set for Myofascial Release that is the fusion of Barnes/Myers/Upledger and previous eastern hands on modalities. I hold advanced certifications and specializations in Myofascial Release Therapy, Canadian and US registrations in Specialized Kinesiology, Acupressure, Cupping, Shiatsu, and the designation of Master in Reiki. Additionally the CHEK Institute has certified me as a HLC2 lifestyle coach bringing together advanced understanding of stress, nutrition, sleep patterns, and exercise. Jane McKinnon Wilson, MSc., H.B. and Audrey Devitt, BASc, MA. DESCRIPTOR: The brain is an organ in the body and similar to all organs goes through changes as we age. The presentation will focus on: the functional changes that impact memory and/or mood; healthy brain exercises; and changes in lifestyles to sustain a healthy brain. 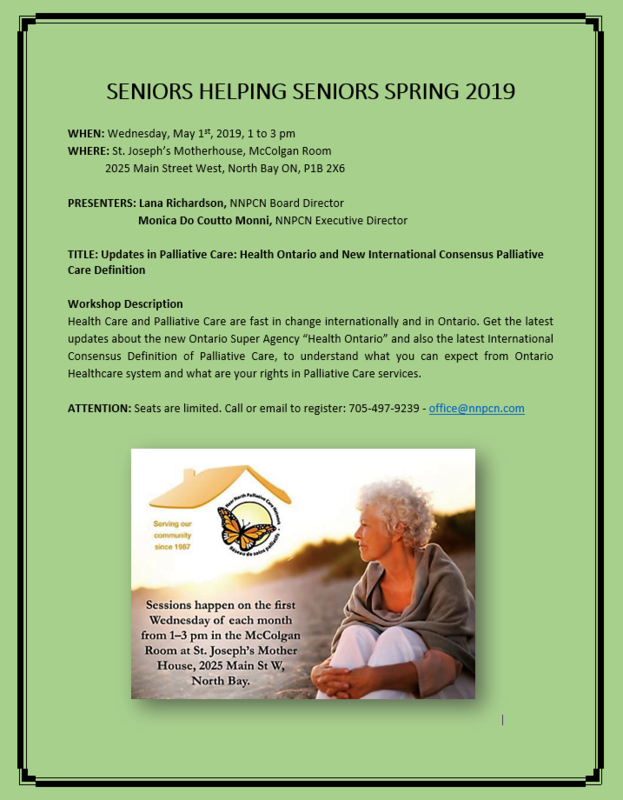 PRESENTERS: Jane McKinnon Wilson is the Director of Regional Geriatric Program Central at Hamilton Health Sciences, St. Peter’s Hospital in Hamilton. Audrey Devitt is the Waterloo-Wellington Specialized Geriatric Services System Coordinator with the Canadian Mental Health Association of Waterloo-Wellington and St. Joseph’s Health Centre in Guelph. 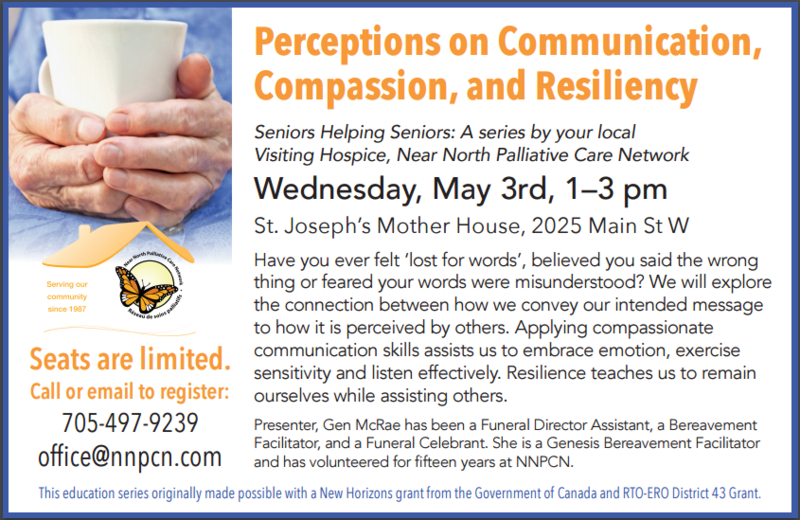 Both of these engaging speakers bring a wealth of experience in geriatric care and mental health to the valuable insights they will share. 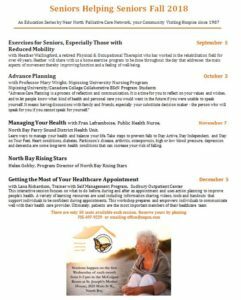 DESCRIPTOR: Using a hypothetical case of a couple struggling (partner with Lewy Body Dementia), the presenter will lead the participants through a journey from despair (compassion fatigue) to understanding the attributes of why a person may experience “learned helplessness” thru the climb back up to “hope”. What is hope? How do we nurture and sustain positive living in life? Sharing research, BC Caregiver Toolkit and “Hope” based resources one transitions from despair to hope in a journey with concepts and resources to empower the participant. PRESENTER: Bob Spicer has an M.A. 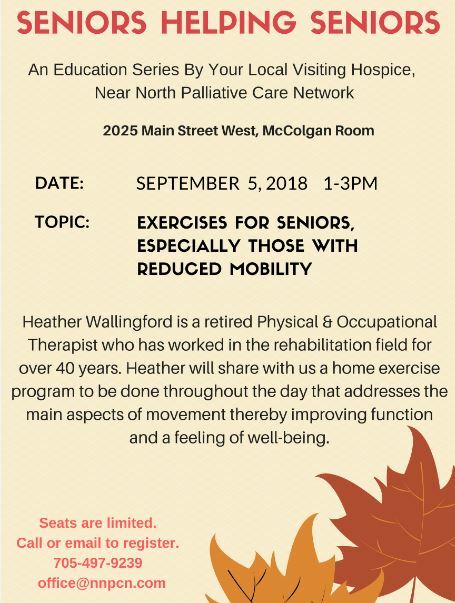 in Recreation & Leisure Studies and Gerontology (U. of Waterloo) and 25 years experience working within “older adult” care environments as a Recreation Therapist (Continuing Care), College Instructor: Interventions, Communication, Mental Health (college – 3 yrs FT), and various consultant roles. 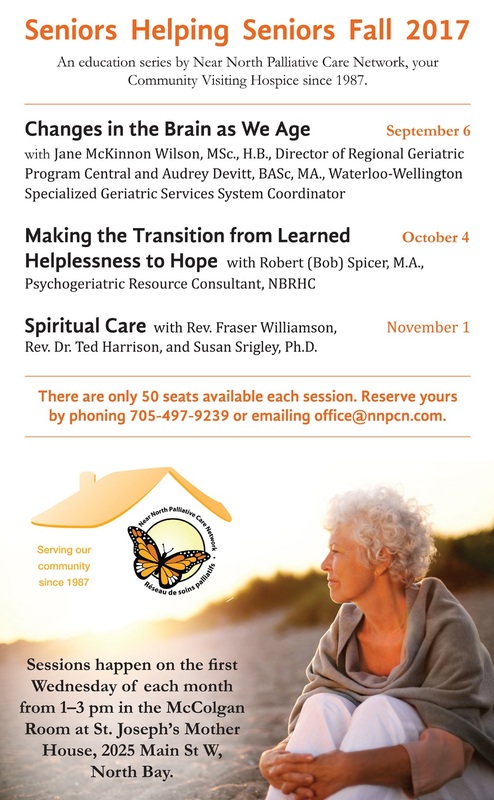 He is currently the Psychogeriatric Resource Consultant (past 15 years) at the North Bay Regional Health Centre. DESCRIPTOR: Death is one of the great mysteries of human existence, and questions about its meaning have been explored throughout time by philosophers, theologians, poets and artists. Religious rituals, spirituality and myriad beliefs have emerged as a way to navigate and interpret death and dying. Our three speakers will offer different perspectives on how others have contemplated this mystery in order to help us attend to the spiritual connections between life and death. PRESENTERS: Fraser Williamson is the Minister at Trinity United Church in Magnetawan and NNPCN Board Director – Almaguin Lead. Rev. Dr. Ted Harrison is Minister at Trinity United Church in North Bay. WE NEED YOUR HELP TO KEEP SERVING OUR COMMUNITY! SUPPORT YOUR LOCAL VISITING HOSPICE ALL YEAR THROUGH! 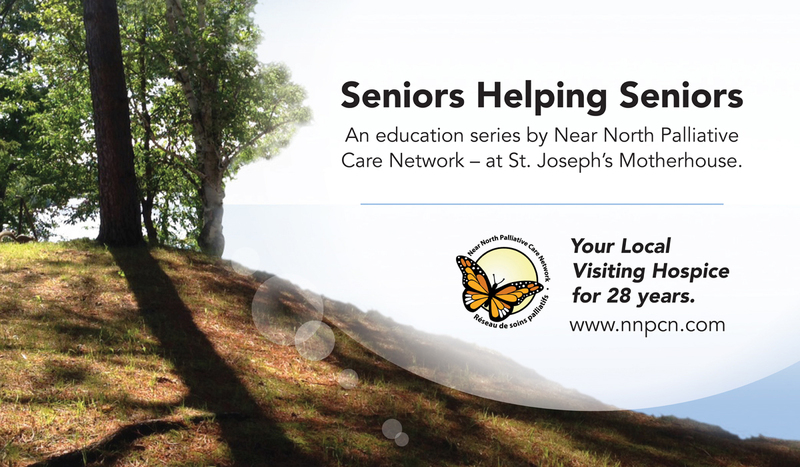 Near North Palliative Care Network, YOUR LOCAL VISITING HOSPICE SINCE 1987, launched their new Public Services Project “SENIORS HELPING SENIORS”. 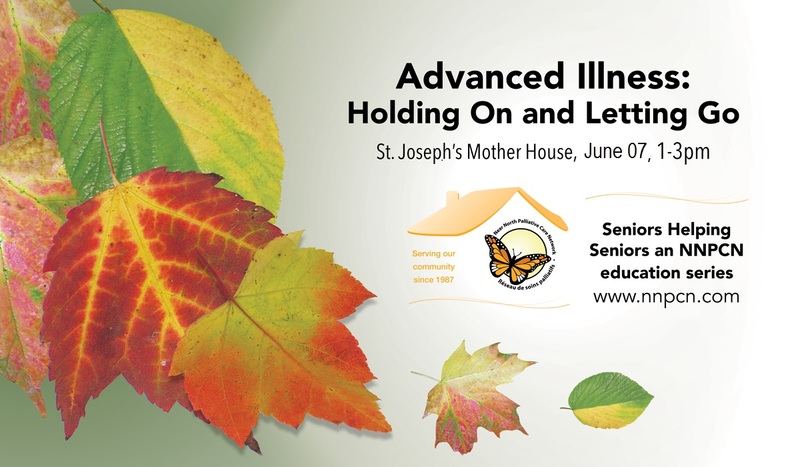 A series of free monthly training sessions for Seniors and Caregivers will be happening at St. Joseph’s Motherhouse from September 07, 2016 to June 2017. The idea behind the project “SENIORS HELPING SENIORS” is to empower the community with free education and training about End of Life. 68% of our Seniors choose to age and die at home. This means that we need a massive percentage of our population trained to give care to their loved ones at home while keeping a high quality of life as caregivers, and giving high-quality end-of-life to their loved ones. 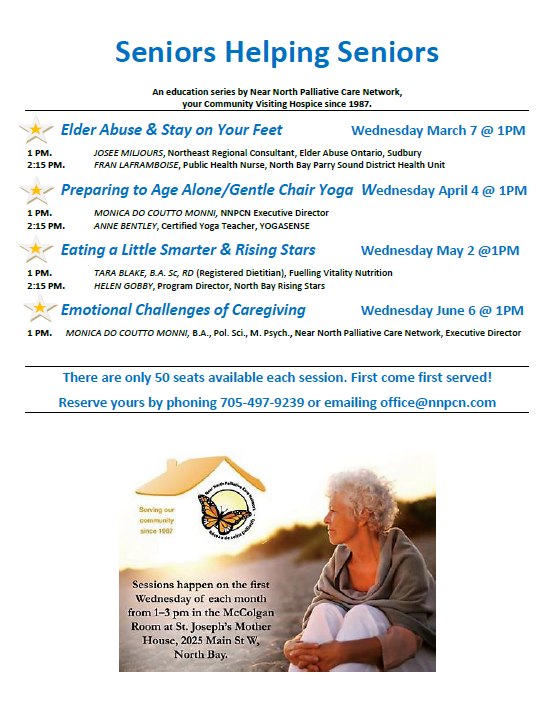 All Seniors and Caregivers of our community are invited to participate and there is no charge. The first session happens on September 07, 2016. Check dates, themes and presenters of sessions below ! This series was initiated with a Government of Canada New Horizons grant. It is also made possible with an RTO-ERO grant, and brought to you by Near North Palliative Care Network, YOUR LOCAL VISITING HOSPICE. ATTENTION, LIMITED NUMBER OF SEATS! Contact us to reserve your seats! Communication is a vital part of our everyday lives as we connect with one another. We convey messages and share our stories using words, body language, tone and emotion. Our challenge is to understand others and to be understood when we discuss everyday life situations or serious events. Have you ever felt ‘lost for words’, believed you said the wrong thing or feared your words were misunderstood? We will explore the connection between how we convey our intended message to how it is perceived by others. Applying compassionate communication skills assists us to embrace emotion, exercise sensitivity and listen effectively. Resilience teaches us to remain ourselves while assisting others. Gen has worked in funeral services in Toronto and North Bay as a Funeral Director Assistant, a Bereavement Facilitator, and a Funeral Celebrant. She completed training as a Funeral Celebrant at King’s College in London. For the past 17 years, she has officiated personalized funeral services throughout the North Bay area. Gen is a Genesis Bereavement Facilitator. She has provided group and individual bereavement support at Hospice Richmond Hill, York Family Funeral Centre in Thornhill, Rosar Morrison Funeral Home in Toronto, and Near North Palliative Care. She served as the Regional Volunteer Representative for Bereavement Ontario Network and has volunteered 15 years at Near North Palliative Care. WHEN: June 07, 2017 – 1 to 3 PM. Life can be very fragile. We have all experienced many “ letting go” and many “ good bye’s in our life time. It is in the moments of letting go we recognize that we may still hold on a bit longer. During this presentation, you will see how closely interconnected the holding on and letting go can be. Heather McGuinty is a registered nurse who for 40 years has worked in both the hospital and community sectors. She is presently working as Palliative Care Coordinator with the Community Care Access Centre and has been privileged to have cared for and journeyed with many patients and their families during the patient’s final days of their lives. 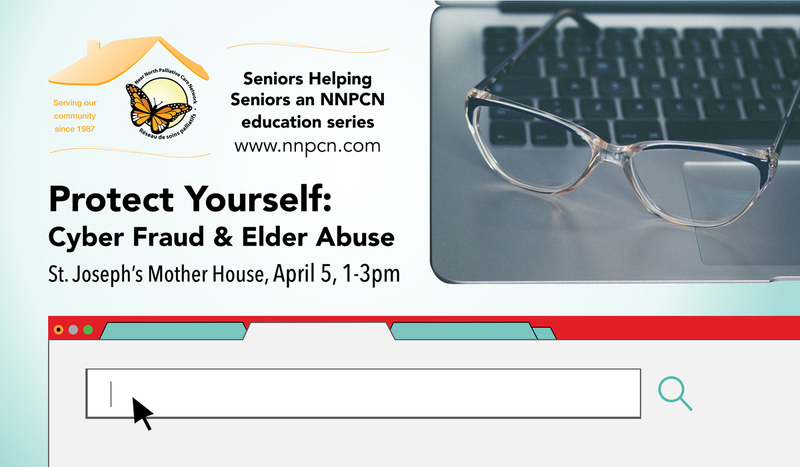 Then Deborah Emmerson from Victim Services of Nipissing District will share information about the signs of elder abuse and what to do about it. The VSND works in partnership with police as well as emergency and other community-based services to ensure victims receive the help they need. CHECK COMPLETE DESCRIPTION OF EACH SESSION BELOW. WHEN: December 07, 2016 – 1 to 3 PM. WHERE: ELKS CLUB NORTH BAY. ATTENTION, LIMITED NUMBER OF FREE SEATS! Contact us to reserve your seats! Lynn Lawson has been a Nurse Practitioner in Geriatrics and Palliative Care for 17 years. In her 33 years of nursing she has cared for and supported many patients as they search for meaning and peace in letting go of life and embracing death. She has supported all her patients’ family members as they struggle with the pain and loss of losing their loved one and find grace during it all. Lynn has learned to love and care for others with compassion and an open heart and that is the practice she brings to every day as a Nurse Practitioner and to everyone she interacts with. At St. Joseph’s Motherhouse for 6 and-a-half years now, she is the Director of Care and Nurse Practitioner for the Sisters living there. WHEN: November 02nd, 2016 – 1 to 3 PM. 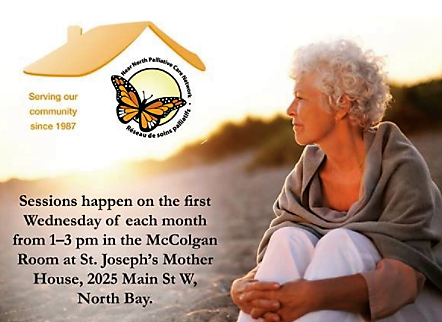 WHERE: McColgan Room, St. Joseph’s Motherhouse, 2025 Main Street West, North Bay ON, P1B 2X6. Access to appropriate palliative care is a concern for many Canadian residents. 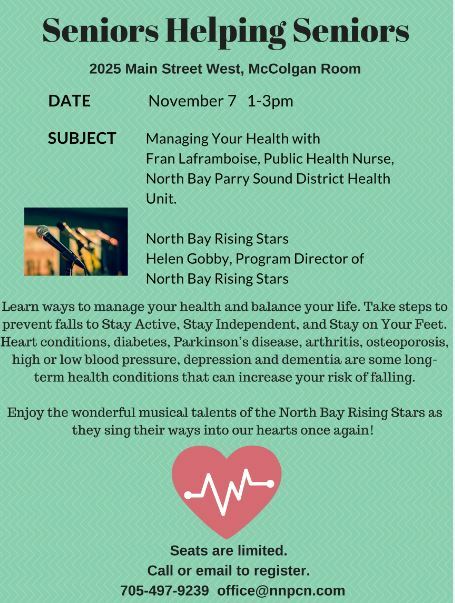 We in North Bay and surrounding area are fortunate to have many options available to us, but we also face some hurdles to receiving good care. We offer an honest presentation about the challenges, but also about the precious time at the end of life. Most people who are facing end-of-life would prefer to spend their last days at home surrounded by family, in a familiar and comfortable environment. If it is the wish of your loved one, there are agencies, services and volunteer networks in our community that will support these wishes. Learn about what resources are available and how you can support those wishing to spend their last days at home. 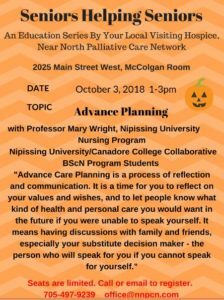 Our three speakers have a wealth of experience in nursing and palliative care; each of them has supported many families through this vulnerable time. Carol Owens worked as a community visiting nurse with the VON for almost 30 years in North Bay and surrounding areas. She had innumerable interesting experiences as a registered nurse “out in the field”, but found her deepest passion was in caring for her many palliative care clients and their caregivers. Her most rewarding career moments were in supporting them at their most vulnerable, and becoming intimately involved in their end-of-life journeys. She became a member of the Board of Directors at NNPCN, and their trainer for new volunteers following her retirement, as a way to continue to serve the palliative clients in the area and the loved ones who care for them. Cecilia Grasser was a registered nurse with over 37 years of diversified experience in surgery, medicine, obstetrics, community health, telephone triage nursing, NECCAC case management and discharge planning at NBRHC before she retired in 2014. 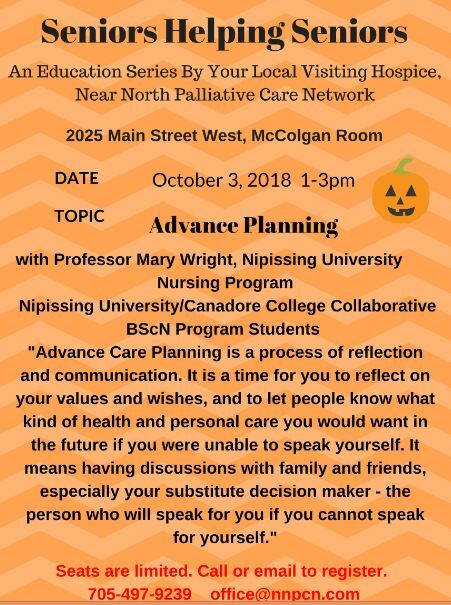 Her vast nursing experience, broad knowledge base and her great interest in palliative care make her a great resource for the Seniors Helping Seniors program. Debbie Sloss is a retired registered nurse who worked most of her 35-year-career with the VON providing nursing care in the community. Her passion was to provide excellent palliative care to those who were diagnosed with a life limiting illness. That passion still is an interest even in retirement. She has many other interests, including her granddaughter, family, enjoying the outdoors, crafts, baking and travelling that also keep her very busy. WHEN: October 05, 2016 – First workshop: 1 to 3 PM. Second workshop: 3 to 5 PM. 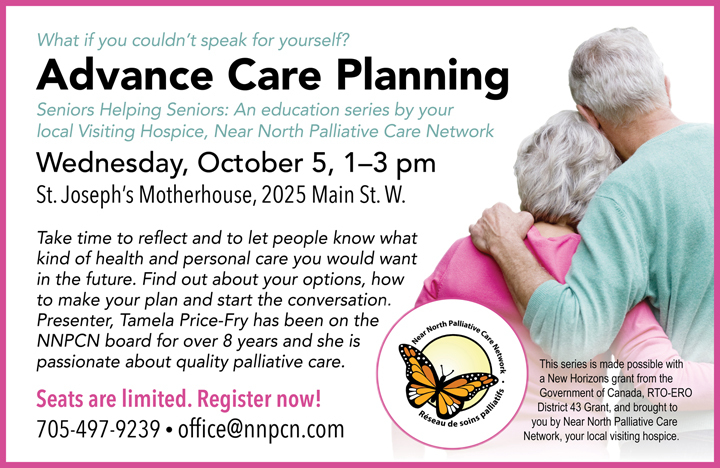 IMPORTANT: DUE TO HUGE DEMAND TO SESSION 2, ADVANCE CARE PLANNING, WE WILL OFFER TWO WORKSHOPS ON OCTOBER 05. FIRST WORKSHOP AT 1 PM AND SECOND WORKSHOP AT 3 PM. What if you couldn’t speak for yourself? 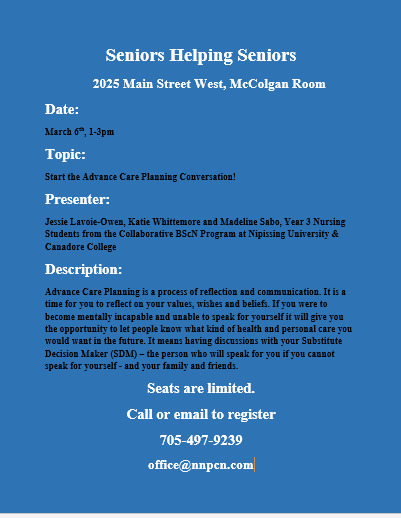 Advance Care Planning is a process of reflection and communication. It is a time for you to reflect on your values and wishes, and to let people know what kind of health and personal care you would want in the future if you were unable to speak for yourself. 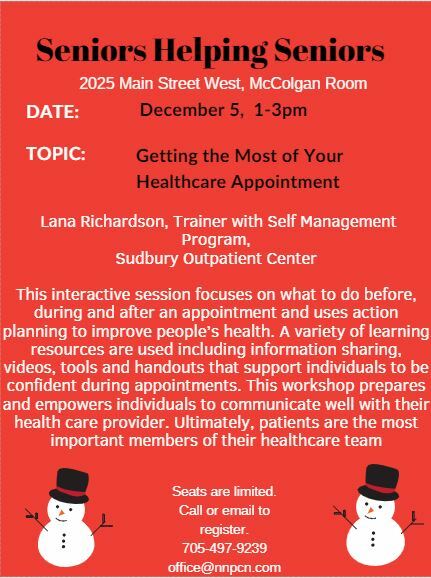 This session will provide you with answers to your questions and the resources and tools to understand your options, make your plan, and have the conversation. Tamela Price-Fry has been on the Near North Palliative Care Network board for over 8 years, and part of the Evergreen Hospice prior to returning to the north. With more than 10 years experience, she is passionate about quality palliative care. She also brings more than 30 years of work experience, which includes, marketing, sales, human resources and administration. She is currently a member of the board with Cassellholme Home for the Aged, and committee member with the North Bay Regional Health Centre Foundation in North Bay. 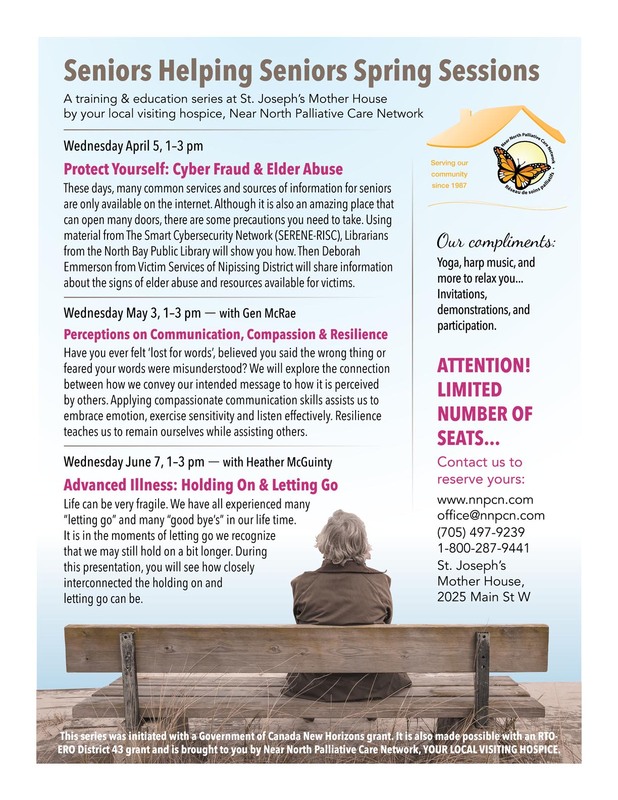 WHERE: Conference Room, St. Joseph’s Motherhouse, 2025 Main Street West, North Bay ON, P1B 2X6. We grieve every time we experience loss. As we age, we experience more loss and more grief, including anticipatory grief, multiple losses, loss of health, mobility, income, family members and friends, socio-economic status and much more. How can we help ourselves, and give support to our loved ones in the middle of multiple losses, as we age? 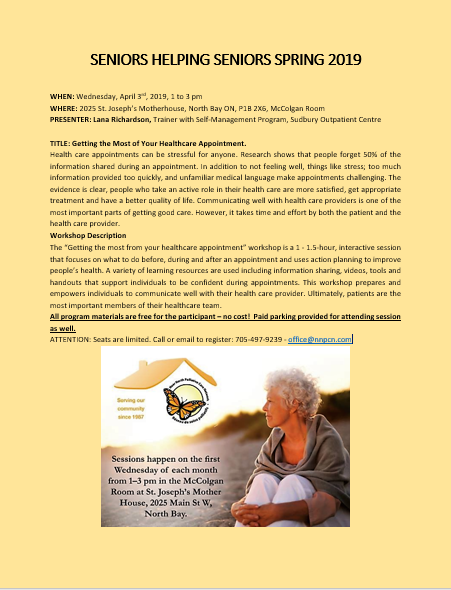 This session will help you understand many aspects of aging and loss, and also provide you very simple and straightforward tools that will help you keep your personal quality of life and help your loved ones do the same, especially when end-of-life approaches. Monica Do Coutto Monni, B.A. Pol.Sci. M. 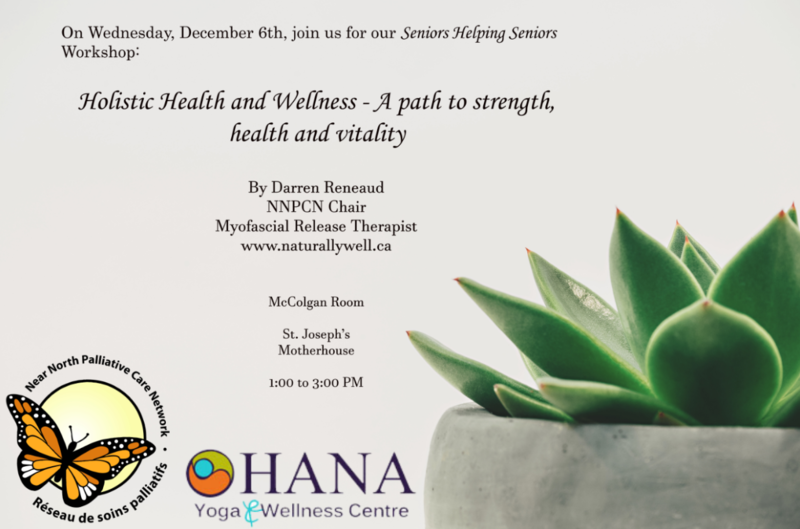 Psych., is the Executive Director of Near North Palliative Care Network, Vice-Chair of the BON (Bereavement Ontario Network), Palliative Care Instructor at Canadore College, a professional member of the Canadian Counselling and Psychotherapy Association, and sole proprietor of DCM Education and Training. Among other specializations, Monica holds certification in Board Governance (The State University of New York), and Training and Learning Programs for Volunteer Community Health Workers (Johns Hopkins University). She has international experience in non-profit and for-profit top management, a solid vision of organizational structure and strategic growth. A Canadian-Brazilian citizen, Monica formerly owned a for-profit training institute in Brazil, and worked for many years in education and training, as MBA international liaison among Universidade Sao Francisco, Stanford and Harvard Universities. Monica got involved with Hospice Palliative Care and Bereavement Education and Training in Canada in 2009. 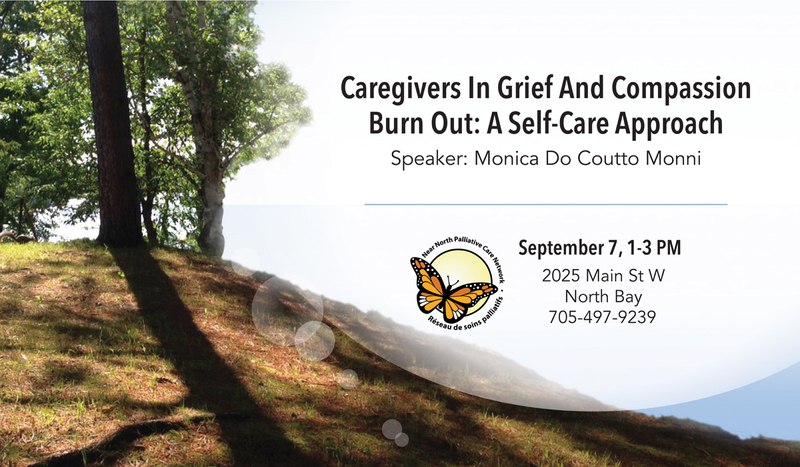 Since then, she has developed Grief and Bereavement training and services for the Near North Palliative Care Network and DCM Education and Training, and has trained new teams of Bereavement and Grief Volunteers in several locations of Ontario. 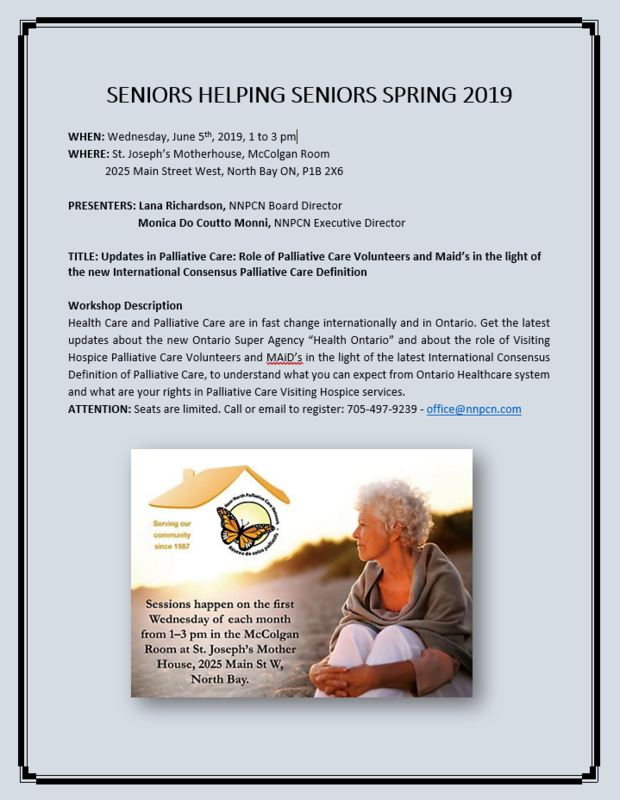 She is one of the authors of the new HPCO – Hospice Palliative Care of Ontario online Training Program for Hospice Volunteers in Ontario.